Best For Anti-Aging / All Skin Types. Guinot Creme Age Logic is the first skincare product actually capable of deprogramming the aging process. 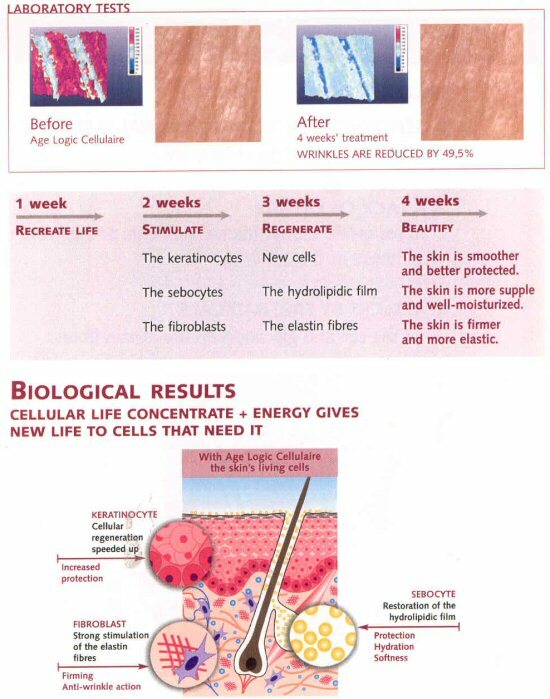 It combines Cellular Energy and the regenerating power of cellular life concentrate to firm and nourish skin, improve hydrate level, and create renewed cellular activity. After using for one month, a reduction in visible signs of aging on the skin can be observed. Guinot Creme Age Logic is ideal for maturing skin of all skin types. It works to smooth wrinkles and fine lines for a healthy, glowing complexion. Provides skin with 56 essential elements. Aids in the healing of damaged skin. After thoroughly cleansing the face, apply morning and evening; suitable for mature and/or dull and lifeless skin. Use appropriate skin care products for the skin's needs. Oxynergin (Bacterial Filtrate)- Helps support cellular oxygenation via the mitochondria, thuss stimulating their natural processes. Vitamins E + C + Anti-Glycation - Helps combat the formation of free radicals and the glycation phenomenon. Water (Aqua), Cyclomethicone, Dimethicone, Glycerin, Caprylic/Capric/Succinic Triglyceride, Dimethicone Crosspolymer, Magnesium Sulfate, Cewtyl PEG/PPG-10/1 Dimethicone, PVP, Sodium Ascorbyl Phosphate, Phenoxyethanol, Fragrance (Parfum), Biosaccharide Gum-1, Glyceryl Polymethacrylate, hydrolyzed Soy Protein, Tocopheryl Acetate, Propylene Glycol, Methylparaben, Hexyldecanol, Hexyl Cinnamal, Betaine, Hydrolyzed Wheat Protein, Linalool, Pectin, Butylparaben, Ethylparaben, Glucose, Hydrolyzed Glycosaminoglycans, Propylparaben, Isobutylparaben, Copper Gluconate, Magnesium Aspartate, limonene, Disodium Adenosine Triphosphate, Prolyl Histamine HCI, Butylene Glycol, Butylphenyl Methylpropional, Sodium Chloride, hydroxyisohexyl 3-Cyclohexene Carboxaldehyde, Pyrus Malus (Apple) Fruit Extract, Benzyl Benzoate, Zinc Gluconate, Potassium Sorbate, Yellow 5 (CI 19140), Potassium Chloride, Trisodium EDTA, Calcium Chloride, REd 4 (CI 14700), Sodium Methylparaben, Glutamic ACid, Sodium Phosphate, Leucine, Glutamine, Arginine, Lysine, Aspartic Acid, Threonine, Tyrosine, Alanine, Glycine, Phenylalanine, Serine, Sodium Acetate, Valine, Isoleucine, Proline, Sodium Dehydroacetate, Methionine, Sorbic Acid, Histidine, Tryptophan, Adenine, hydroxyproline, Tetrasodium EDTA, Adenosine Triphosphate, DNA, RNA, Adenosine Phosphate, Ascorbic Acid, Biotin, Calcium Pantothenate, Cholesterol, Cysteine, Folic Acid, Glutathione, Inositol, Menadione, Niacin, Niacinaminde, PABA, Pyridoxine CHI, Retinyl Acetate, Riboflavin, Thiamine HCI, Tocopherol.